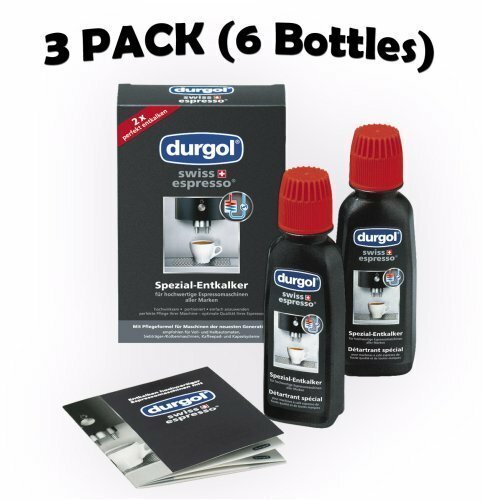 durgolÂ® swiss espressoÂ® works 5-10 times faster than other branded decalcifiers. There is no need to interrupt the decalcification process to wait for durgolÂ® swiss espressoÂ® to work. One single-portion bottle (4.2 fl.oz./125 ml) of durgolÂ® swiss espressoÂ® can dissolve up to 0.35 oz./10 g of lime. This is sufficient to decalcify one espresso machine once. Because of its special corrosion protection formula durgolÂ® swiss espressoÂ® will not damage your espresso machine when used correctly. No residue that could clog your machine will develop during decalcification. durgolÂ® swiss espressoÂ® comes ready to use. In contrast with powder or tablet decalcifiers it is not necessary to dissolve durgolÂ® swiss espressoÂ® in water. Liquid durgolÂ® swiss espressoÂ® does not contain any additives such as those found in tablets which can clog your machine. The durgolÂ® swiss espressoÂ® bottle is made of PET and is therefore environmentally compatible and recyclable. If you have any questions about this product by Durgol, contact us by completing and submitting the form below. If you are looking for a specif part number, please include it with your message.